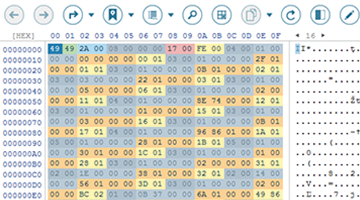 Try CI Hex Viewer now! When ease of use is in question, CI Hex Viewer comes at hand. Binary structures function makes data parsing faster and easier by several times. Easy-to-write structure templates with simple and understandable program syntax to define any type of files and storages. Structure template customization with possibility to set necessary structure field parameters and specify distinct data forms. Establishing conditions with “if” and “when” in order to set actions for corresponding file or storage structure fields. Adding dependent structures attached to the basic data block structure allowing you to view separate derived data blocks as a single set. Automatic templates assignment to all files and storages of the same type. The software detects a data source format and attaches the defined structure template to all equal data sources. Context structure inspector gives prompts about structure template components allowing easy navigation within the structure template. Detailed structure information to show the structure composed and to be assigned to the data block. CI Hex Viewer is a helpful tool for those dealing with RAID storages. Binary data analysis and raw data editing is now available for disassembled RAIDs. RAID Builder offers a variety of options for quick and correct RAID assembly. All you need is setting required parameters for your RAID. For more exact assembly results, the hexadecimal viewer is at your disposal for each of the RAID components. Automatic RAID assembly substantially saves your time. Embedded RAID detection function offers instant RAID assembly if its components are intact. Parity Tool is a ready-to-use solution for RAID levels implementing parity. The program gives an end parity calculation result for a sum of separate data components. Logical operations such as XOR and GFmul require no actions from you. Get ready data calculations for data parity. RAID Levels include JBOD, RAID0, RAID3, RAID4, RAID5, RAID6. Besides, the software supports processing of complex levels such as RAID10, RAID0+1, RAID50 etc. Custom RAID lets you create your own RAID configuration setting preferred RAID parameters. 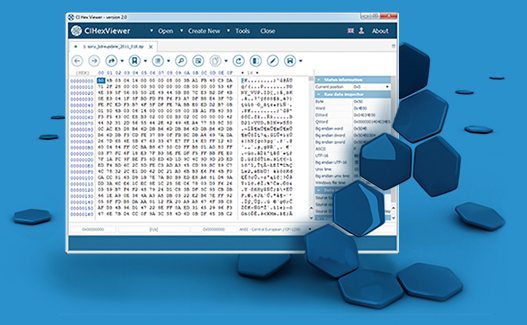 CI Hex Viewer offers a broad set of tools for convenience of raw data editing. Besides, the software provides all means to ensure source data safety. Physical disks, disk images, virtual drives, disk partitions, files and even separate data fragments are all available for modification with CI Hex Viewer. Find and replace tool based on several search methods including advanced hexadecimal search with adjustable syntax provides precise data search results. Data overwrite pattern simplifies data exchange between the storages. The software merely copies the defined data range from the source to the target at a given location. Automatic Span Tool lets you create one solid file from an unlimited number of different disk and file components. Safe data editing mode ensures maximum protection from accidental data editing errors and, as a result, irreversible data loss. Among all, the software provides possibility to create a new file or a new virtual disk designated for safe data editing. Abundance of tools for binary data analysis and data editing enclosed in one CI Hex Viewer software. From data bookmarks up to complex mechanisms for automatic calculation of logical operations – all aimed at saving you effort and time. Effortless binary data viewing with helpful tools for jumping over data positions, marking data range and a variety of data copying and saving options. Customizable user interface with possibility to adjust hexadecimal field representation up to your own choice. Data Inspector for viewing and editing data values in both hexadecimal and text representations instantly. Data source properties and status information to speed up data analysis relying on data source information already summarized by the software. More than twenty text encodings to cover vast variety of possible text representations and to find approach to diversity of data formats. Easy data comparison with Data Comparison Tool providing full analysis of all matches and differences in binary data of disks, files and any parts thereof. Advanced simultaneous search with Parallel Search Tool to find necessary information in several sources at the same time.